162:8.3 As Martha busied herself with all these supposed duties, she was perturbed because Mary did nothing to help. 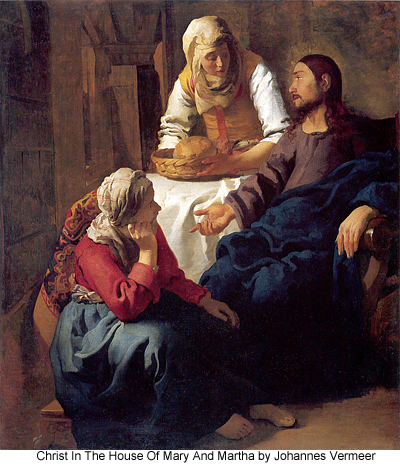 Therefore she went to Jesus and said: "Master, do you not care that my sister has left me alone to do all of the serving? Will you not bid her to come and help me?" Jesus answered: "Martha, Martha, why are you always anxious about so many things and troubled by so many trifles? Only one thing is really worth while, and since Mary has chosen this good and needful part, I shall not take it away from her. But when will both of you learn to live as I have taught you: both serving in co-operation and both refreshing your souls in unison? Can you not learn that there is a time for everything — that the lesser matters of life should give way before the greater things of the heavenly kingdom?" Luke 10:38 N ow as they went on their way, he entered a village; and a woman named Martha received him into her house. And she had a sister called Mary, who sat at the Lord's feet and listened to his teaching. But Martha was distracted with much serving; and she went to him and said, "Lord, do you not care that my sister has left me to serve alone? Tell her then to help me." But the Lord answered her, "Martha, Martha, you are anxious and troubled about many things; one thing is needful. Mary has chosen the good portion, which shall not be taken away from her."